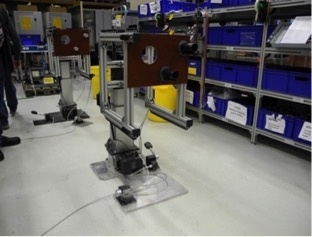 All workstations have an electronic Shop-Floor lift module which is lifted and lowered by means of a pushbutton, and a rotary module operated by means of two foot switches. The rotary module has indexations which may be released in steps of 45° by two foot switches. For the purpose of preserving the surfaces during work, a clamping device with brushes on the bearing surfaces holds the inner containers. Laboratory technology provider, Thermo Fisher Scientific, has developed an ergonomically designed production line for the manual assembly of a new model series of incubators. The company’s priorities were operator health, process and product quality, with time and cost considerations taking second place. In the development of the assembly workstations, Thermo Fisher Scientific liaised with ROEMHELD for assembly and handling technology. The new "Heracell Vios" incubators were intended for medical engineering and health research, where they would be used for cultivating human and animal cells. Target customers were universities, research laboratories and industry. Numerous variations for different applications would be assembled in the plant at Langenselbold near Frankfurt, where Thermo Fisher Scientific has consolidated its laboratory equipment production. Apart from two sizes with 160 and 240 litres of useful space, bactericidal and fungicidal models of copper were available in addition to incubators with a stainless steel inner container. The portfolio also included incubators for different gases and with varying sensor technology. The new incubator was the successor of the successful model "Heracell" of which 75,000 units were sold in 15 years. The new series was launched in September 2014 and is distinguished by its optimised control behaviour, improved protection against contamination and facilitated operation. According to Thermo Fisher, the company is the global market leader in this product field. In the development of the assembly workstations, Thermo Fisher Scientific cooperated with ROEMHELD experts for assembly and handling technology. The company, with headquarters in Hessian Laubach near Gießen, has been a supplier and partner in the assembly and handling of laboratory equipment for the medical engineering manufacturer since 2009. ROEMHELD’s modulog system comprises numerous modules designed to provide the optimum and ergonomic position of objects for manual assembly. Horizontal and vertical rotation, tilting, lifting, placement and movement are the basic manipulations. This modular system offers application flexibility and variably combinable components for loads from 10 kg to 600 kg; operation is optional, either manually on the module directly, or electrically via levers or buttons. The latest Modulog development is a rotary module with media feed-troughs. These, for example, allow for the hydraulic, electrical or pneumatic operation of devices clamped by zero-point clamping systems without complex boring. Pergande was very satisfied with the cooperation: "ROEMHELD's consultation quality was extremely high, they intensely and dedicatedly responded to our individual requirements. In addition, their products are very reliable and can be configured according to our requirements - we do not have to buy anything ready-made." Regarding the concept of the new manual assembly workstation, ergonomics were of particular significance to Production Resources Engineer, Stefan Kämmerer. Although the earlier incubator series had been assembled on height-adjustable tables, the units, with a weight of around twenty kilogrammes, had to be moved manually without any auxiliary equipment. "For this reason, preassembly of the inner containers required a lot of handling and was physically more demanding", says Kämmerer. This had to be improved for the production of the new series. The inside casing, which is open to the front, has a height of approx. 700 mm and a width of 450 mm for the 160-litre incubator type and is manufactured in Thermo Fisher's own sheet workshop. 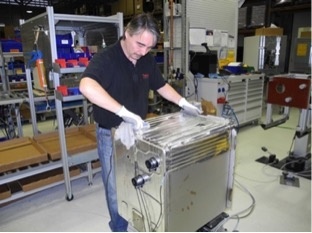 In preassembly, an employee covers all five sides with heater foils; for this purpose, the container has to be rotated several times. Apart from this, a sensor and a fixture have to be mounted. The entire process takes about 45 minutes; subsequently, insulation is attached and the outside casing is assembled over it. The site in Langenselbold has around 150 assembly employees, of whom eight are assigned to the manufacture of incubators, in one or two shifts as required. With the support of Manfred Parr, ROEMHELD Assembly Technology Product Manager, Kämmerer and Pergande designed a line of four similar assembly workstations arranged successively. Two of them were suitable for the assembly of the larger incubator models. All workstations comprised an electronic Shop-Floor lift module with a stroke of 200 mm, which could be lifted and lowered by a pushbutton, and a rotary module. This rotary module was provided with indexations which could be released manually in steps of 45°; for this purpose, the fitter could use two foot switches without having to walk around the longitudinally arranged container. "The prototype of the assembly workstations had only one foot switch. In order to be able to work more efficiently, the fitters had the idea of a second foot switch; this suggestion was rapidly implemented by ROEMHELD", Kämmerer remembers. After the design of the assembly workstations was completed, he ordered the components from ROEMHELD and assembled them. For the purpose of preserving the surfaces during work, he also developed a clamping device provided with brushes on the bearing surfaces. All parties involved were satisfied with the result of the workstation design. Technical Head Felix, Pergande, emphasised the excellent ergonomics and evident improvement in product quality: "The clear position fixation and the defined handling by means of the 45° indexations noticeably reduced the risk of dents in the container." According to him, time saving, as frequently experienced after the optimisation of other assembly workstations, was irrelevant in this case. Reduced cost was not calculated, either. However, he emphasised that the ergonomic design of the workstations contributed to protecting the employees' health and that "the absence of an employee costs money, because either we cannot produce or we have to assign a replacement." As a consequence, less rejects and healthier employees contribute to cost savings and enhance Thermo Fisher's success as market leader. The preassembly staff also had positive things to say. Equipment fitter Steffen Hillesheim said: "An ergonomic workstation with useful features like this is invaluable. It is good for the back, neck, and shoulders and is a noticeable relief. The body feels it immediately." Hillesheim knew what he was talking about, as he had been working for Thermo Fisher for a few weeks only and says he has gained a lot of experience on assembly workstations not complying with the latest occupational health and safety regulations. To find out more about Roemheld’s full range of zero point mounting, workholding and materials handling solutions, go to www.roemheld.co.uk or telephone 01462 459052.